"Cocina Mediterranea y del Mundo, "XIV"
You must be a member of the San José DinnerNations Group to attend this activity. Would you like to join this group? Serving authentic mediterránean food and authentic spanish tapas, fresh fish, sea food, and delicios lamb Protected content has become an InterNations/ DinnerNations favorite! An excellent environment with light music to enjoy with your Friends. 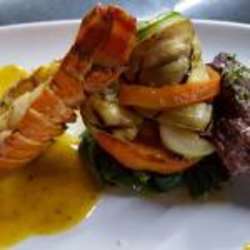 “Valentine's Day Lunch” 5 of 5 stars Reviewed February 13, Protected content by a fair Price/Quality restaurant; food well cooked, good environment; a feel like Spain in Costa Rica. Its a must if you are around. " "Awesome food, friendly service, nice atmosphere, beautiful infrastructure, colorful decorations, highly recommended!!"